It's 6.12 am on the first Sunday morning in July. I'm stood on a road next to the Italian equivalent of a village green. I've got my bike and my cycling kit on but I'm also wearing a black bin liner with holes ripped in for my head and arms. I'm trying to stay warm as sun isn't quite up and the temperature is barely in double figures. A few feet from me former England rugby captain Martin Johnson leans against his bike in just cycling jersey and shorts, apparently oblivious to the cold. A hot air ballon is tethered immediately to my right with occasional blast of air from the pilot to keep it buoyant. No less than three helicopters are circling overhead with cameramen hanging out the side beaming back live TV pictures to national television. U2 booms out over the PA system, occasionally interrupted by a steady stream of cycling glitterati - Miguel Indurain, Eddie Merckx and Elia Vivania - who I assume are there but I can't see them. Somewhere not far away from me is Sir Dave Brailsford. Behind me are 9,000 other cyclists all waiting for the start of the Maratona dles Dolomites. As a member of the press I'm somehow in the front pen wearing number 136. I've done a total of three bicycle rides since November, including being carried out on my shield after 82 miles of the 100 mile Black Rat the previous month. I'm surrounded by a mixture of apparent semi-pros, celebrities and employees of the sponsors. Some of the latter group appear in worse condition than me so I take some reassurance from that whilst trying to jump up and down a bit to stay warm. "Who wants to ride the Maratona?" came the email from the Sportive.com editor in late April/early May. I had become a little bit obsessed with the event. In 2016 I was successful in the ballot (a one-in-six chance) put had to forgo the place due to the arrival of my daughter. 2017 missed out in the ballot, 2018 I hadn't considered it due to lack of fitness because of aforementioned childcare issues. However, here was an opportunity that might not come around again. "I'll do it if no one else can" I replied. No one else could. I was in. The late scrabble for accommodation and transport at the right price then began. In the end from my Bristol home I opted to fly out on the Friday from Cardiff to Munich on Flybe. Hire car to German/Austrian border for the night. Drive into Italy, register, put bike together Saturday. Cycle Sunday. All the way back to Munich for return flight on Monday evening. The only flaw in the plan was that Flybe only take bicycles on a standby basis. If a flight is too full with luggage then the bike gets bumped to the next available flight. Things didn't start well at Cardiff airport as the computer was down so we are checked in by someone filling out our details longhand. After an hour I got to the front of the queue. The check-in person sucked air through his teeth at the sight of my bike bag "The flight's quite full and we've already got one bike on there. Yours might not make it." I asked a few more questions. Apparently, I would only find out whether or not my bike had made the flight when I landed in Munich and it either did or didn't turn up on the carousel. I asked more questions, but rather than field them Mr Flybe changed tack. "There's only a few more to check in, I think you will be all right." Once on board the plane a manual head count took place due to the computer problems. This initially came back with the wrong number. Eventually the number of people matched up but there was a difference in the number of males and females that should have been on board. Finally, 90 minutes late, we took off. Events ran a lot smoother for the rest of the day so that I ended up in my prebooked German hotel/restaurant at around 9.30pm. Although it was situated in a small village near the Austrian border the place was rocking as two parties were in full swing. I was promised an evening meal in half an hour. When the appointed time arrived I was directed to one of the restaurant rooms and a single table in the midst of an all-female birthday party. A hush descended as I entered the room, but once they established that I could only speak about three words of German ("Ich bin nicht der Stripper"? - Ed), the festivities were back into full swing. The following day I had a four-hour drive into Austria and the mountains. This evolved into ever smaller roads as I headed into the Dolomites. I could tell I was getting close to the event as the fairly narrow road became ever busier with cyclists. 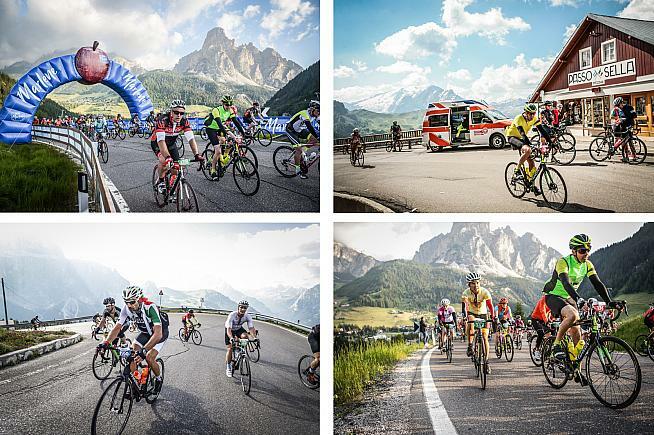 The Maratona has a whole week of cycling-related events that precede the main ride. Saturday afternoon was the last opportunity to sign on and collect riders numbers and I was confronted with a mixture of riders doing just that or getting in a final practice ride. The main sign on point was near the start in La Villa. Most people seemed to be cycling to the sign on although there was a free shuttle bus running from surrounding villages every 20-30 minutes. Sign on was open from Wednesday and Thursday evening, Friday afternoon and all day Saturday. However, as a press entrant I had to attend the press office at the finish line in Corvara. The two were only a ten-minute cycle ride apart on reasonably flat roads. I arrived in the small town of Corvara and managed to park on the edge of the aforementioned village green. The setting was spectacular with mountains rising up on all sides, along with cable cars and ski stations. Set up was nearing completion for the event including a temporary television studio at the finish line. I located the press office and received my pack. This included a jersey and gillet that were optional for the event. The gillet was made out of 100% recycled material. Along with a few freebies and marketing material about local produce was one rider number and some safety pins for the back of my jersey and a number and cable ties for the handlebars. The latter also incorporated the timing transponder for which I had to leave a ten euro deposit. I had tried to book a hotel as close to the start as possible due to the 6.30am roll out time. I got lucky and secured the last room of thirty in a hotel in Arabba, a twenty-minute drive from the start. This was another picturesque village with a ski station. I only realised on arrival that it was actually on the Maratona route at the bottom of the first descent. I hadn't quite worked out the best way to the start but the hotel owner, Manuel, solved the problem. He had booked me on a free coach to the start at 5am, although "You will have to find your own way back". Breakfast was available from 4am. The afternoon was spent building my bike and then turning in for an early night. Psychologically I couldn't get up any earlier than 4am but this proved to be an error. I rolled down for breakfast where Manuel was fantastic in laying on all sorts of gluten-free produce for me. However, I then felt rushed for time to get myself together. I stumbled out bang on 5am. There was a bus and a separate truck with trailer for the bikes. The bikes were packed on the truck with great care, each one separated from the next by a blanket. Finally, when all was ready we drove up the mountain and down the other side into Corvara. There was one moment of concern as the bus only just made it under an inflatable sponsor's arch across the road, a la Orica bus at Tour de France in Corsica. We had inches to spare but made it to Corvara where the bikes were then offloaded as the road from there to La Villa was closed to all but cyclists. It was no more than a ten-minute roll down to the start line but it felt quite cold as it was all slightly downhill with no pedalling required to warm up. I was in the pen well before the 6.15am cut off. If that deadline had been missed then I would have been directed to the rear pen. There was a steady stream of riders along the top road from where I was stood making their way to the other start pens. At 6.30 the flag fell and we were off back down the same road to Corvara. It was carnage for at least the first two kilometres. Riders all over the road of differing abilities and speeds trying to gain position or, like me, stay out of trouble. I genuinely feared for one rider on a recumbent bicycle, who looked like he was going to get steam rollered on a couple of occasions. The etiquette for closed road events on the continent is to cycle on the right hand side and allow faster riders to overtook on the left. I tried to remain as close to the right as possible without riding in the gutter but I had still riders coming past me in the gutter to my right. We whizzed through Corvara and straight onto the first climb of the day the Campolongo. This was the same road I had driven to Arabba. Both the ascent and descent had looked pretty intimidating in the car but but felt a lot better in reality. The average gradient was 6.1% for a 5.8km climb. I found all of the climbs I completed to be pretty consistent in terms of average gradient without any short, steep ramps that sometimes occur in the UK. The road surfaces were also quite reasonable rather than the reported stereotypical moon craters. I was able to get into a rhythm. I took on a caffine shot to wake me up and everything felt good. The course profile apparently indicated the points for mechanical assistance and food stations. There didn't appear to be any mobile mechanics on the course but the static ones were fairly frequent, usually at the top or bottom of a climb. The profile indicated a mechanic stop at the top of the Campolongo but no food station. However, on arrival there was a food station but it was on the left hand side of the road rather than the right. It was too late for me to get across without playing a real life game of Frogger as the road was still thick with bikes at this point. There were some portable toilets on the right with a queue of female riders gradually forming. I took stock and a drink and started on the descent to Arabba. There were a couple of genuine hairpins but I was having fun. I was even considering taking on one of the longer courses. 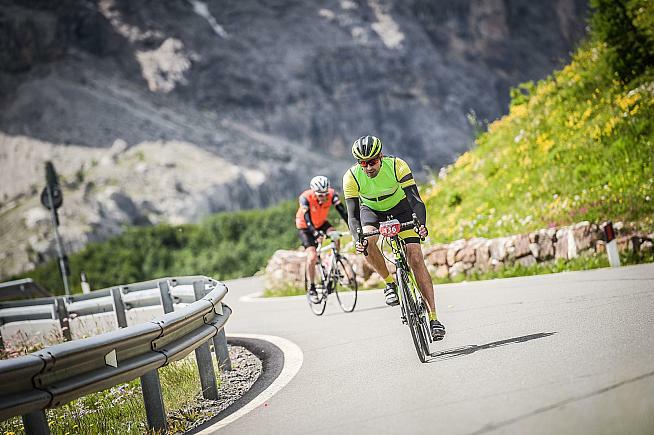 There are three different courses for the Maratona. Everybody completes the Sellaronda, incorporating four climbs over 55km and 1780 metres of climbing. This was my target. However, you could then continue onto the Middle Course which involved climbing the Campolongo and descent to Arabba a second time before diverting off to a couple more climbs, totalling 106km and 3130 metres of climbing. The full Maratona course diverted from the Middle Course after Arabba and added up to 138km and 4230 uphill metres. All routes finished in Corvara. In Arabba I made the strategic decision for a pit stop in my hotel room, both to use the facilities and sort myself out where I had been rushed in the early hours. This took about ten minutes but when I rejoined the road was still busy. The number of every rider's back also showed their name and national flag. It was quite entertaining looking at who was around you and, in my case, watch the rider numbers going past me getting ever higher. Although there was a substantial number of Italians there was a genuine mix of riders from all over the world on the evidence of my eyes. The second climb of the Pordoi was longer (9.2km) and steeper (6.9%) rising to the summit at 2239 metres. Reality bit me halfway up that any visions of doing the Middle course should be shelved. I was still making progress but I could feel that the long-term endurance wasn't there. The riders were thinning out a bit more on the road and there was an opportunity to enjoy some of the incredible scenery without worrying about getting knocked off. I was hailed by another Brit, Rob Noble, who said that his best friend had the same name as me. Rob had already completed the Sellaronda in training earlier that week and had planned to do the full Maratona. However, a rogue salad the previous day had left him unable to keep any food down and he was disappointed to have to reduce his expectations as a result. Our conversation took my thoughts off the road and to my surprise we were soon at the top of the climb. I waved Rob on his way as I knew he would descend faster than me. At some point there was even cows with cow bells on during one of the descents. Previously I had only ever seen people ringing cow bells at similar events. There was a food station towards the foot of the next climb, the Sella (2244m). The food stations had water and coca cola, oranges, lemons, bananas and chocolate biscuits in abundance. There were gluten-free options on request which I didn't try. There were also various local delicacies at certain feed stations including strudel and barley soup. Segafredo had a coffee point at the top of the next climb, the Gardena. The Sella was the steepest climb on the short course at 7.9% although only 5.5km long. On leaving the feed station there was a group of about 20 young locals stationed across the width of a road in an arrow shape so each rider had to cycle through them to the tip of the arrow and out they other side. They were shaking cowbells, banging drums and one had what looked like a massive Italian version of a wooden football rattle. It was a boost to receive such support including a high five from the conductor as you emerged from the funnel. I could still hear them at work when I was half way up the mountain. At this point I had a couple of pauses to gather myself and then keep going up the climb. The weather by now was warm sunshine and there was plenty of space on the road. At the top I met another Brit whose ambitions for the full course had been thwarted. He had suffered a tyre blow out on a descent, was covered in scratches and a bit of blood and was holding his broken derailleur in his hand. His hope was to get down the descent and find a mechanic to try and at least complete the Sellaronda. After the descent the last climb was the Gardena (4.3% at 5.8km). This featured the only bit of short flat on the whole route which was otherwise a crocodile tooth profile - so the actual uphill gradient for most of it was probably at least 5%. The food station at the foot of the climb was starting to close up when I arrived. Once I realised the Sellaronda was the limit of my capabilities I had taken things at my own pace, stopping to take photographs, not worried about the cut-off time. For those doing the Middle Course the Sellaronda had to be completed by 11.15am and then there was a further cut off at some point after Arabba for the full course of 11.45am. The Gardena descent was long with a mixture of open, straight roads and some switchback bends. There weren't many others around me at this point so I could use as much of the road as I wanted. Gradually more houses sprang up at the side of the road until I was in Corvara and crossing the finish line twenty minutes after the cut-off time. I like to think I could have made it at a push, but I still had to cycle the first half of the Middle Course anyway just to get back to my hotel. Once across the line, local children were cutting the numbers, including the timing transponder, off handlebars and then handing them back to the riders. At the next point I had to give the number/transponder back and choose either my 10 euro deposit or a Maratona baseball cap in return. I took the money. A medal was then hung around my neck, an energy drink thrust in my hand and I gradually moved out of the finish area. There was a secure and guarded bike park where you could leave you cycle without fear of it being nicked. A numbered band was put on the bike and another on your wrist and you were only allowed to leave with a bike if the two matched. There were shower facilities and about twenty stations for a free massage, neither of which I used. I did go into the large permanent hall by the finish to get some food. Each rider had four paper tokens in their race pack which could be exchanged respectively for a bowl of pasta (two different flavours but no gluten-free); chips or a dessert; steak or sausage and a drink. I rested up, ate my food and then got back on the bike to tackle the Campolongo one more time back to my hotel. The whole event was all very well organised. The Maratona has been running for over thirty years and so any rough edges have been ironed out. The theme for this year's edition was equilibrium, and there are strong green credentials threaded through everything. I witnessed team of fathers and sons clearing up litter on the mountains a long way from any feed stations. Even the day after litter clearing was still going on. There is obviously a lot of pride from everyone in the region about the fantastic views and environment they live in, and the scenery is definitely the star of the show. 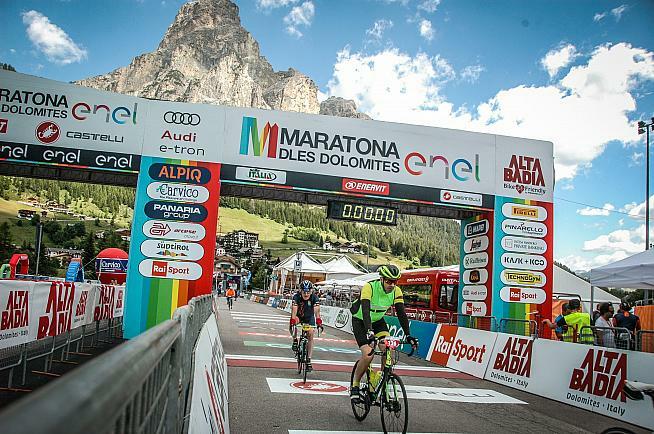 I would love to come back to Corvara and try one of the longer Maratona courses when fitter. That will require either a sympathetic editor or some luck in the ballot. 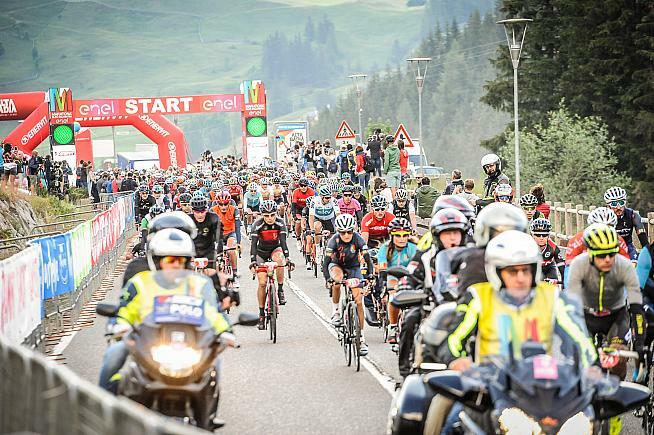 The Maratona returns on 7th July 2019. For more information visit www.maratona.it. Register with Sportive.com to receive an email notification when the entry ballot opens: www.sportive.com/signup. Event photography by Sportograf: www.sportograf.com.